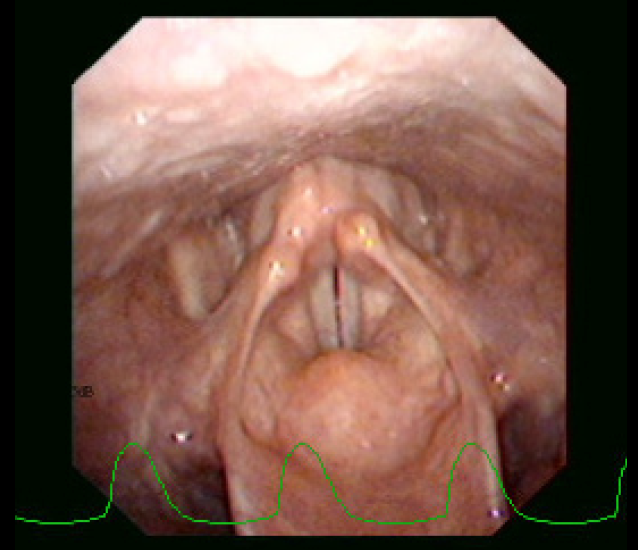 When looking at the videos from the endoscopy study in 2007 certain patterns are seen in the laryngeal gestures AND the waveform within each mode. A still image for each of the modes was produced from the videos. The Laryngeal gestures and the Laryngograph waveforms are more to be seen as patterns of progression from mode to mode, rather than absolutes. The larynx, the laryngeal gestures and the waveforms often differ from singer to singer, some singers have really weird waveforms, but still the patterns often show similar features. The progressive change in the patterns can be used as a guideline on how to identify the modes for an individual singer. On the stills from the videos and on the video itself both the laryngeal gestures and the waveform are seen. Also notice the Neutral without air laryngograph waveform shows a shallower upward (closing) and downward (opening) curve compared to the sinusoidal waveform with occasional spike seen in Neutral with air. This corespond nicely with the louder volume often used in Neutral without air compared to Neutral with air. When compared to the metallic modes, the waveform is frequently bell shaped and symmetrical and the overall contact time is reduced which means that the gaps (when the vocal folds are apart) are shorter.